I’m a bit late to the party on this one, but this song is impossible not to wiggle a bit to! Also, I want to be in Justin Timberlake’s entourage. Happy Friday! May 22nd marked the one month point in my ACL reconstruction recovery. Yesterday was a big day for me. I had my first day back in the office (I had been working from home for the last two weeks) which was amazing… it was so nice to see all my friends again and to be back out in society! As fun as staying home for a month sounds, it really does get old, especially when you have very limited mobility. I also had my second physical therapy session. Not to brag, but I’ve been exceptionally good about doing my exercises and it shows. If I can make one recommendation to anyone facing this surgery, it’s do your exercises before, during, and after your procedure! I reached 110 degrees of bend yesterday and was actually allowed to get on the bike and turn the pedals over. Sounds like a small thing, but it’s HUGE. Finally feeling like I can move my body is amazing! Don’t get me wrong, I’m not riding the Tour yet, but I can move my legs for about 5 minutes a day at no resistance. Baby steps. The last lagging “pain” I have is in two places: my hamstring and my incision. My hamstring is where they pulled the tendons from – it’s just a sort of sore, stretching feeling if I move to quickly. I was advised to chill on those exercises to let it continue to heal. The incision is the general byproduct of surgery – it’s numb right where the cut is, then the outer edges feel like they’re on fire if something (the bed sheets in the middle of the night, for example) brushes across them. Annoying, yes. Permanent, nope. Time heals all wounds. I’m still not cleared to swim (something I’m really looking forward to) and I have another two weeks on crutches and with my brace. The graft is at it’s weakest right now, so I’m doing my best to remember to take it slow and not to stress it! I’m trying to be patient and keep my eye on the prize (getting back on my horse!) while pushing myself to continue to rebuild my missing muscle. I’m going to start this post off with a disclaimer… while I generally try to be light and happy about life, I also want to use this blog to be real. This is definitely not one of those bright and shiny posts… if you’re looking for cute horse pictures or funny jokes, go ahead and skip this one. I did a lot of research before I had my ACL reconstruction surgery. I mean A LOT. I learned all about allograft vs. autograft (cadaver vs. my own), the different types of autograft (hamstring, Achilles, or patellar tendon), and recovery times (8 months to a year). It never even crossed my mind to research post-operative pain management. I hobbled out of the surgery center with 100 Norcos in my pocket and a numb leg. Fast forward three weeks. My knee was feeling pretty good and the broken toe was tolerable. I was finally to the point that Advil just about took care of any residual pain, so I tapered off the Norco with 12 pills left, feeling pretty strong and proud of myself. Then came the unexpected. I went to bed Tuesday night and couldn’t sleep. Not even a little bit. I didn’t just have restless leg syndrome, I had restless everything. My stomach was upset, I was clammy, hot, and I was starting to get a headache. It was terrible. I finally fell asleep just after midnight, thinking I was coming down with some sort of flu. Wednesday, the symptoms all continued and intensified. Thursday was even worse. I felt super emotional and anxious. I emailed my doctor who confirmed what my husband and I had begun to suspect – somehow, while I was busy healing, my body had become addicted and I was having withdrawals. Now, I’m sure on the scale of withdrawals it was minor, but I honestly felt terrible until about Sunday morning. I was blown away that in just under three weeks my body had developed such a strong dependence on something that would make me feel so terrible. I am so, so, so lucky in that several people close to me have experience with addiction and were able to help talk me through what I was feeling (you know who you are and you know how much I love you!). Sometimes it helps infinitely to have someone tell you that you’re not crazy and you’re not going to die. Let me be clear. At no point did I abuse the medication I was given and at no point did I “crave” more (thank goodness!). I simply stopped taking the pills once my pain was manageable. And became acutely aware of how so many people each day can very easily get hooked on opiates… because just one more pill would make the yucky symptoms go away. It was completely eye opening and terrifying. The question at the end of the day: knowing what I know now, would I do it the same way? I honestly don’t know. I’m a firm believer that we can and are doing wonderful things with modern medicine and that no one should have to deal with major or chronic pain. I do wonder if there was something less strong, something less major that could have helped me without the terrible withdrawal symptoms. So there you have it. My candid, not so pretty story of withdrawal. It’s not meant to scare you, but to just let you know if you’re facing surgery that it’s a very real consequence of taking pain medication, even prescribed, and to help you be prepared. If you or someone you know need help with prescription or other drugs, please visit http://www.na.org. Talk to your doctor, find a meeting, take action. I can’t believe it’s been three weeks (and one day) since my surgery! My knee has been healing really well – all of my incisions look great and I started physical therapy this week. I’m proud to say that I’m ahead of where they expected me to be at this point; something the therapist credits to my pre-surgery exercises. 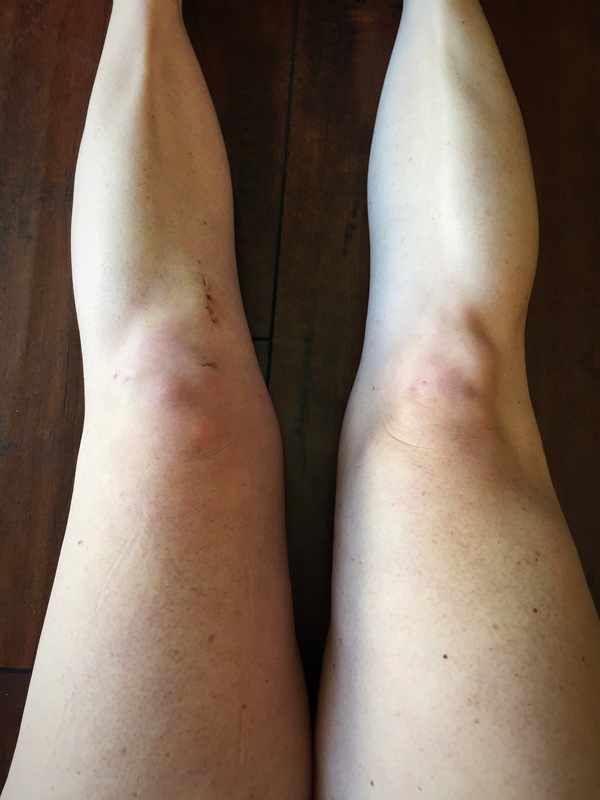 If you’re considering ACL reconstruction, DO YOUR PREWORK! Even with a lot of up front work, I’m still amazed at how much my quad has atrophied in the last three weeks. In the picture below, I have both legs flexed as hard as I can. Seriously, in real life it looks worse than the picture. I’ve been lucky – I was able to do straight legged raises since the first day – a lot of people struggle with just that! I’ve still got a long way to go, but am happy with where I am so far! More to come! As you know, I’m tucked away at home recovering from ACL surgery. Yesterday was my first day “back” at work – I’m so, so, so thankful to have an employer who is willing to let me work from home for a little while so that I can keep my knee up and continue healing. Yup, I broke the damn thing – it’s pointing at about 2 o’clock. And, it’s on my “good” leg, so walking with crutches has just become even more fun. I called my mama and promptly lost.my.cookies. Like crying A LOT. I didn’t even do that when I hurt my knee… I think it’s just everything all at once and feeling really stupid for now doing this. She calmed me down and told me to call the advice nurse who basically told me to ice and elevate, that if I went in they’d likely take an x-ray and tell me it was broken, which we already know. She had me send a picture to my regular doctor and he’s supposed to call me back with additional instructions. My awesome brother-in-law came over this afternoon to let the dogs out (something I struggled with when I had one working leg), which officially makes him my hero (Mike is off on a control burn in his battalion). Is everyone ready for the #thetoe posts on Instagram?